Where to buy good robotics kits? We all might have come across this quote one way or another in our lifetime. And it makes a lot of sense to concentrate on the work that we do with our hands to create a better future for everyone in this world. I recently came across one student who seems to have taken this quote to an entirely different level, where he worked on providing an additional hand for everyone to get more things done is short period of time. And succeeded in it too. Sang-won Leigh is the guy behind this. He worked on a project for MIT’s Fluid Interfaces course. The project is based on the topic – Robotic Symbionts Wearable. For the people who are wondering what the above topic is, Robotic Symbionts are like cyborg devices which any human can integrate to his/her body. These electronic devices are developed in such a way to receive commands directly from the humans using nerve impulses. So, you can literally control these devices just by thinking about them in your brain. Super awesome isn’t it! But it is good news for people who are in need of an additional limb. The device senses electrical signals sent to the brachioradialis muscle in our forearm and actuates accordingly. Since this muscle is not used to control any of our hands, with few hours of practice anyone will be able to operate it with ease. This robotic hand (described as a “body integrated programmable joints interface”) is integrated with 11 motors that can be rearranged and reprogrammed to satisfy different uses according to the users. As the technologies around us are advancing very rapidly, it is becoming more and more important for us to develop an understanding about them as early as possible. And robotics is one such technology which is making its way into almost all the industries and becoming an integral part of their operations. Not only industries, it is also becoming a part of our homes and lives. So, it makes sense for anyone to learn and understand robotics to stay in competition with their peers. Building robotics projects on your own is an excellent way to understand this technology from core. But more often, enthusiasts and aspirants find it extremely difficult to get good robotics project kits. Even though they spend a lot of money and get one, it becomes worthless as they are not sure how to use them. 8 out of 10 parents and students who bought robotics kits give very bad feedback about their experience of using them and being able to learn through them. So, buying correct kits should be done carefully after good thought. If you are one such person who is looking to buy robotics kits to build awesome robots at home, this article is for you. Below are some of the recommendations for getting a good robotics kit. Not only you, there are thousands of people out there who are on the lookout to buy some good robotics kits. Realising this demand, many companies have entered the market and sell low quality robotics kits for higher price with an intention to just make quick money. So, you need to be very careful while buying robotics kits. 1. Buy robotics kit that comes along with a course content: Buying only robotics kits will not help you in improving your knowledge. So, always prefer buying robotics kits that come with a course to help you in learning the concepts from core. 2. Prefer video based learning tutorials: While buying the robotics kit with course content, prefer video based tutorials rather than instruction manuals. As the robotics kits come with complex components, you might find it extremely difficult to build them by referring 2D images given in the manual. 3. 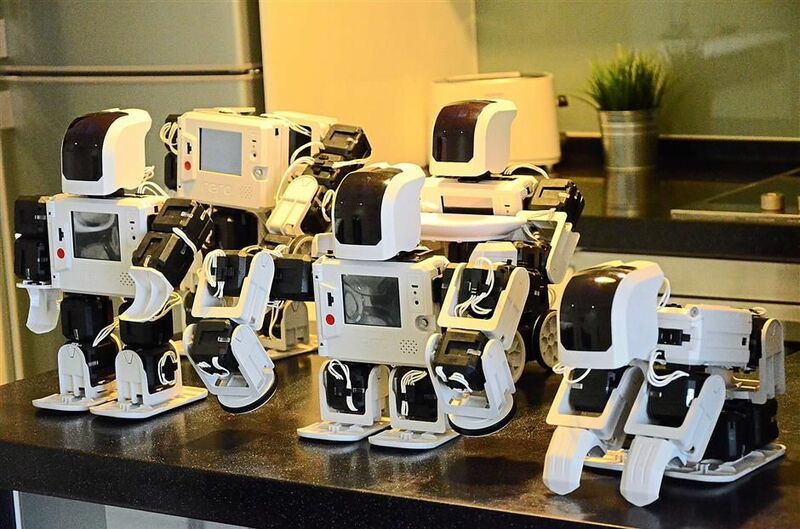 Check for the company’s credibility: As said earlier, there are many companies out there who are selling robotics kits just for making easy money. So before purchasing, check for the company’s credibility by going through their social media presence, Google/Facebook reviews, their other clients etc. 4. Enquire whether technical support will be provided or not: Checking this is very important, as most beginners who don’t have an understanding on electronic components end up burning the IC’s and boards on the Robot by doing wrong connections. So, if the company is providing you with good technical support, you can get proper assistance as and when needed to clarify your doubts and build your robot successfully. 5. Choose robotics kits that provide you a good learning opportunity: Remember, your motive of buying robotics kits is not just to build cool robots & show off to people, but to understand the concepts from core and develop a good understanding on robotics technology. So, prefer the robotics kits that come with good learning opportunity. 6. Select robotics projects that improve your profile: One other advantage of doing robotics, especially if you are an engineering student or aspiring to become one is that it will add credentials to your profile. Doing such robotics projects will greatly help you in cracking core job interviews and getting higher studies admissions in reputed universities. 7. Buy robotics kits that can be upgraded: Since robotics is an evolving technology, try buying the robotics kits that can be upgraded further to build more robots. And only the companies that come with good reputation and excellent presence in education industry can provide you the upgrade option. As they closely work with the industry experts and do a lot of research in developing new robotics projects, they will provide you with assistance to build n number of robots in future too. 8. If you are a parent, buy robotics kits that “involve your kid to build from scratch” and not just “assemble”: You want your kid to believe that he can make robots from scratch – even from junk lying around in the house. You don’t want him to think that he needs a complex $300 kit to build robots. If your kids develop that thinking from the beginning, their thoughts would be limited to only kits and not towards “real innovation” from basics. So, avoid kits that are factory made and look very good and cute. Instead pick kits that look like they are built from scratch using wood, screws, nuts, bolts etc. Let your kid be the “raw innovator” and not the one who can only build when dad/mom buys “costly toys”. The robotics courses that we offer come with an engaging course content delivered with an innovative methodology that ensures your learning, tested genuine kits (dispatched to you in 24 Hrs. ), excellent tech support which you can schedule at your convenience and smart certification to showcase your skills to the world. Junior Level: Build robots along with your kids! – for students age 10+. 1. Line follower robotics kit: This is one of the simple robotics project which your kid can build and get started with in robotics. The robot that your kid build can detect the black line and follow it without deviating with the help of digital IR sensors. Your kid will program the Arduino with simple drag & drop scratch based programming and make the robot work. And your kid can also modify the program later to carryout various robotic operations. 2. Gesture controlled robotics kit: With this robotics project based course, your kid will learn to build his/her very own robot that can be controlled using hand gestures. It follows the same principle as the video game that your kid plays in your mobile phone. The robot uses accelerometer sensor to communicate with the robot and actuate the robot accordingly. Your kid will program the Robot with simple drag & drop scratch programming and make the robot work. 3. Mobile controlled robotics kit: With this robotics project based course, your kid will learn to build his/her very own robot that can be controlled using your mobile phone. The robot uses DTMF technology to communicate with the user and actuate accordingly. Your kid will program the Arduino with simple drag & drop scratch programming and make the robot work. 4. Fire fighting robotics kit: With this robotics project based course, your kid will learn to build his/her very own robot that can detect the fire from a remote location and move in that direction to blow it off. The robot uses digital IR sensors to detect the fire, move in that direction with the help of DC motors and use a miniature DC fan to blow it off. Your kid will program the roobot with simple drag & drop scratch programming and make the robot work. 5. Edge detection robotics kit: With this robotics project based course, your kid will learn to build his/her very own robot that can detect the edges of a table and prevent the robot from falling off. The robot uses digital IR sensors to detect the edges, sends the data to the microcontroller and actuate the robot accordingly. Your kid will program the robot with simple drag & drop scratch programming and make the robot work. 3. Mobile controlled Robotics Kit: This particular robotics kit comes with a DTMF (dual tone multiple frequency) module which can be used to control the robot that you build using your mobile phone. This robot too uses 8051 based microcontroller as its brain and you will be using embedded C language to program the bot. Unlike the above robots, this one will not be autonomous in its actions and so you can control it and make it move in any direction that you want using your mobile phone. 4. Gesture controlled Robotics Kit: This robotics kit comes with an ADXL sensor which has multiple degrees of freedom and you will use that to control the robots movement using your hand gestures. This robot also uses 8051 based microcontroller as its brain and carryout the functions. This particular robotics kit has a lot of scope and is real time application oriented. 5. Bluetooth Robotics Kit: This robotics kit comes with a Bluetooth module which can used to establish communication between the robot and user. You can connect the robot to your device via Bluetooth and control its functions with an Android App. It is an excellent robotics kit to understand the wireless communication process and its integration. 6. Swarm Robotics Kit: This robotics kit comes with 2 robots to facilitate the master and slave communication. It is a very good robotics kit to make you understand the concept behind swarm technologies and it is a perfect example for semi-autonomous robot. You will use 8051 based microcontroller and Rx/Tx modules to establish the communication between the two robots. 7. Maze Solver Robotics Kit: This is one of the most widely built robot that is used in competitions to solve a maze autonomously. Since the programming is little complicated, it falls under the advanced level robotics category. You will be using an 8051 based microcontroller and IR sensors to make it solve the given maze. 8. Biped Walking Robotics Kit: With the help of this robotics kit, you will build a two legged robot or a biped walking robot which will have six degrees of freedom with a hip, knee & foot and mimic the walking action of humans. 9. Hexapod Robotics Kit: With the help of this robotics kit, you will learn to build your very own Hexapod Robot that can be controlled via smartphones using a Bluetooth controlled Android App. The robot that you build will have 6 legs and can be used in any terrains. Why Skyfi Labs to buy robotics kits? All the robotics kits that are offered by Skyfi Labs come with a course (equipped with Learn-Do-Review methodology), which makes sure that you are learning while building robots. With the 100% tested genuine robotic kits shipped to your home, excellent video tutorials (available online 24x7) and good technical support, you can rest assure that you will build great robots and develop a very good robotics career. We wish you will have a great time building robots at your home. Do share your robot building experience below.